Good Morning! It's Monday and my turn to post at La-La Land Crafts. 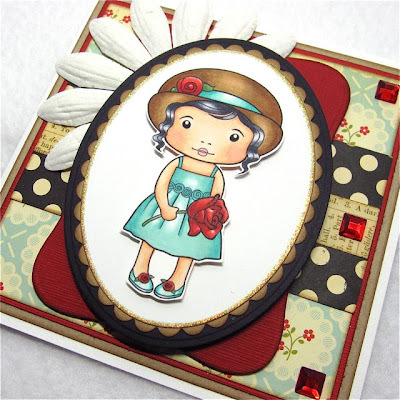 I fell in love with this adorable image and couldn't wait to use her on a card. Meet Marci with Rose. She is the latest image in La-La Land Crafts new line. Marci with Rose, along with Cheerleader Marci, is available in the La-La Land Shop in digi format for a limited time. If you're more of a rubber person, never fear, she will make her rubber debut on September 15th accompanied by the other new images you have seen featured over the past several weeks. This is wonderful! :) Luv the colors and the sparkles too . . . hope you're having a wonderful Labor Day weekend! So cute ! Very nice coloring ! Gorgeous Cheryl! Fantastic layout, I love the flower behind the image. I just love this image, and love the colors you used. That flower peeking out is a nice touch!! 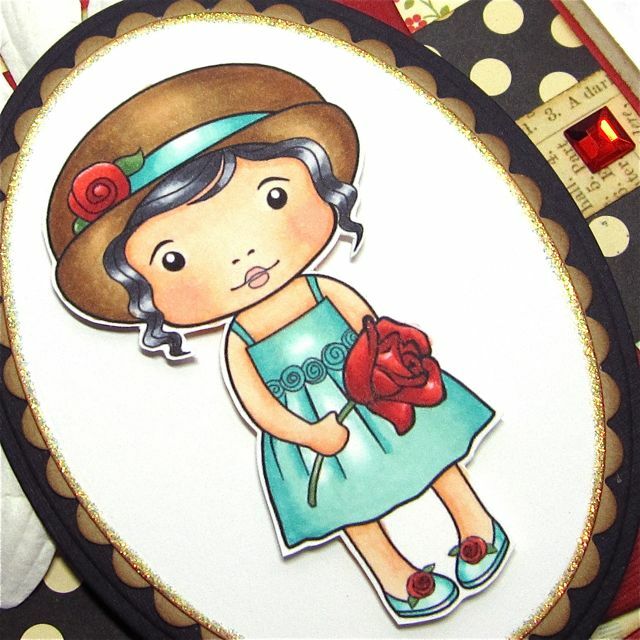 How adorable this little Marci is, with her cute hat and roses! You've colored her to perfection as usual! All of the new images designed by Irina, for LLL are just soooo cute! I really love this card Cheryl - the aqua with the red just pops right off the page!!! GORGEOUS!!! Absolutely stunning card, Cheryl! Wow! Great coloring as always! Awesome card Cheryl. She's super cute!! She's adorable and looks like my bff's grand-daughter. Fantastic card. Fantastic coloring. Love it. But I love everything you create. So there. BIG Halloween Release for Lala Land Crafts! It's new release day at Lala Land Crafts!